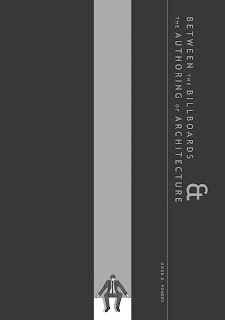 Between The Billboards, by Owen D. Pomery, is about inertia and activity being life-or-death activities is soberly designed, with fonts that almost make it look like a technical manual rather than a comic. Framed by short vignettes taking place in a pub, it's all about physical, intellectual, social and emotional stagnation. In the main story, we meet a man named James Ebner, who has fashioned a dramatic and vivid way of withdrawing from society. In an empty water tower wedged between two billboards, he lives in a room that's in the middle of a city. Each chapter is essentially a setpiece that get at the heart of why he withdrew, the potential for him to come back to society full time, and how living in total isolation and at a great height influences his thoughts regarding oblivion. The first chapter sets all of this up as a kind of man between the margins, unnoticed by most. The second chapter sees an old friend try to talk him out of his solitude, to no avail. The third chapter features James wandering the streets, reminiscing about a particular girl left behind and trading barbed quips with a friend who works at an all-night bowling alley. The fourth sees him confronting death and loneliness after a friend dies, flashing back a bit more to that woman who was so uninhibited about acting on impulse whereas he was so unsure of himself. The fifth chapter features a friend trying a last-ditch effort to get him to come out of the tower and rejoin humanity, as he sharply questions what value James derives from living there. The comparison to playing "noughts and crosses (aka Tic-Tac-Toe) with yourself", in other words, ritualizing one's activities with no possible opportunity for growth or change, is one that implies self-nullification. 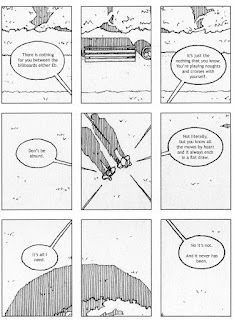 Pomery cleverly uses games of Tic-Tac-Toe as decorative features and page breaks.The final chapter was tragic, not only for the inevitable breaking of inertia in the worst possible way, but the way in which depression's patterns repeat themselves. Pomery's drawings are crisp and precise, making great use of both negative space and geometric patterns, especially when trying to create a vertiginous effect as the reader looks down a sharp drop. 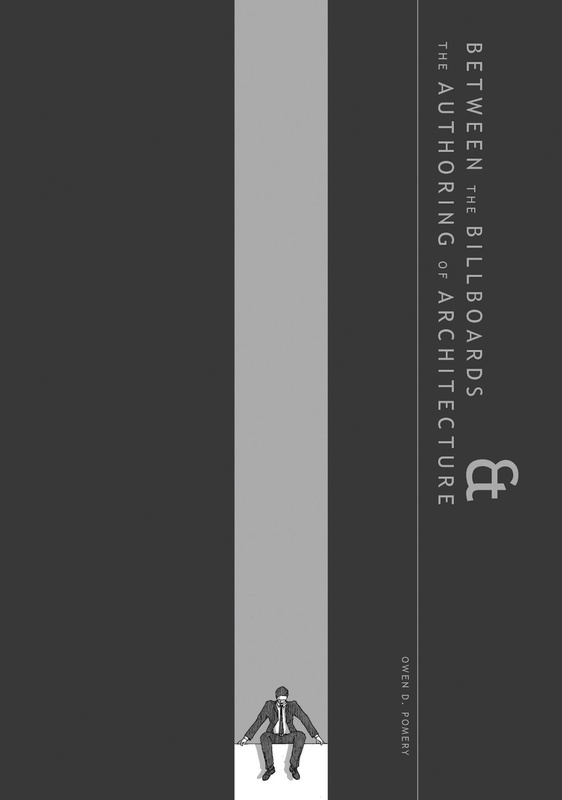 The book's second section, "The Authoring of Architecture", features reflections by Pomery on how his day job (architectural illustration) influences his comics. 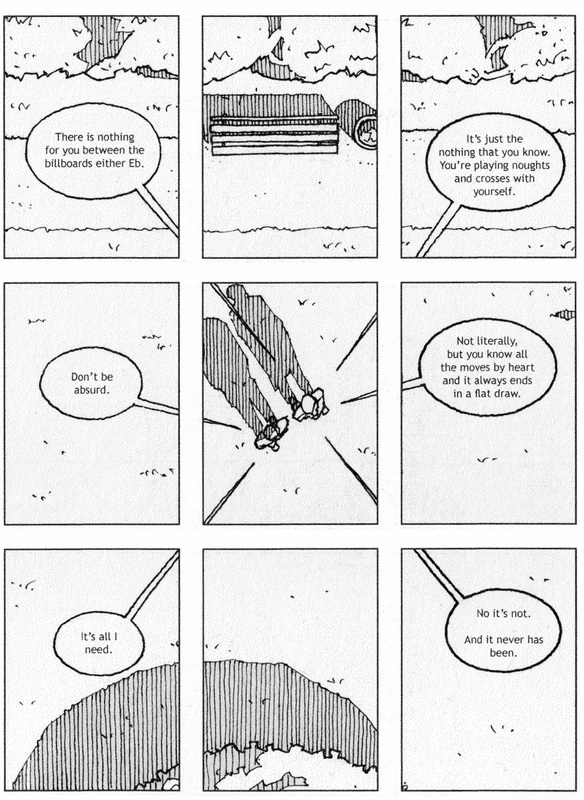 He uses a number of unusual points of view, like directly over the characters, as the reader watches from the sky. His grids often break up images into pieces in the individual panels, forming a fractured gestalt like a blueprint. His pencils are precise, as I noted, but there's also a loose sketchiness to them, as though Pomery was creating that blueprint of what it's like to be human on the page. That sketchiness is what paradoxically breathes life into his figures, as a more rigid naturalism would strangle the story's emotional center. Most of the short stories are experiments in point of view, abstraction and perception. None are especially remarkable, save for a piece about a man who finds he no longer needs to speak in order to manage his way in the world. The final piece of the book's framing device finds the barman telling his customer (and by extension, the reader) "Don't become a regular, now." In other words, avoid falling into that trap of inertia and inactivity.